Refer-a-Friend and Get $20 Rebate. Learn more. For price, street address and purchase, click the camp. After Camp Instruction is available at all locations. Add to your purchase after choosing camp. After Camp Skill Instruction is available at all camps. Water breaks are taken after every break and campers may take water or rest at any time. COACHES: Camps are led by professional, USA Football Certified coaches with High School, College or professional coaching backgrounds. HEROES: NFL Alumni Heroes provide supplemental instruction. These are former players, fathers and family men that played the world’s ultimate team sport at the highest level. They join us because they love teaching kids through football. See participating NFL Alumni Green Bay Packers on tab below. Non-contact football instruction for kids ages 6-14. Green Bay Packers Heroes supplement instruction. Station-based training with Big 6 Drill Design Imperatives for best results. Kids divided by age and experience for “apples to apples” instruction. Small Space Games so campers learn within a 2v2, to 4v4 platform. The Vital 5 Life Skill Lessons integrated into camp daily. USA Football’s Head Up Football Instruction so kids play a better, safer football. Big Football Friday includes Super Bowl Friday, Awards and Recognition. For 5-day, half-day camps, bring a snack and sports-appropriate liquids. We serve only water and/or sports drinks at half-day camps. Learn more at “What to Bring and Know” below. CAMP DIRECTORS: Camps are led by professional, USA Football Certified Coaches. Our coaches develop athletic skill, build confidence and provide positive reinforcement. These outstanding educators are the foundation of our day-to-day operations and the key to our program quality. Our coaches are supported by Heroes from the Green Bay Packers. These are men that earned their living wearing the Green Bay Packers uniform. Packers Heroes are fathers and family men that understand the dynamics of communicating with young people. Packers Heroes appear at various times throughout camp operations. 1) Choose Between: A Five-Day, Full-Day Camp or Five-Day, Half-Day Camps Location. You can only purchase a full-day camp at a full-day camp location. You may not purchase half-day camp at full day location. 5-Day, Half Day Camps available June and July, 8:30 am to 11:30 am. 5-Day, Full Day Camps available June and July, 9:00 am to 3:00 pm. 2) Enter Camp Program (automatically determined by your registration profile). Accelerated Skills Program: Ages 9 to 14 with 1 or more years of team experience. Further build QB, RB and WR skill base | Led by top Coach | Hero participation | Meet w/ Camp Director–set goals. C) Extended Supervision Bring peace of mind and some extra time to your camp experience with extended supervision. With “Extended Supervision” we provide safe care for your camper one hour before and one hour after the official camp operating hours. Extended Supervision is not active camp programming or curriculum. It is simply safe supervision of your camper while you get your things done. All programs led by professional, USA Football Certified coaches. NFL Alumni Heroes from the Green Bay Packers or other NFL teams provide supplemental instruction. Kids are divided by age and experience levels for “apples to apples” instruction. We welcome “group with” requests and do our best to accommodate. Our instruction platform is station-based training. Instruction Philosophy All camps use a “station-based training” format to provide instruction. Groups rotate around the field—like a classroom–visiting each instruction station. At each station, the professional coach adapts the instruction to fit the group needs. 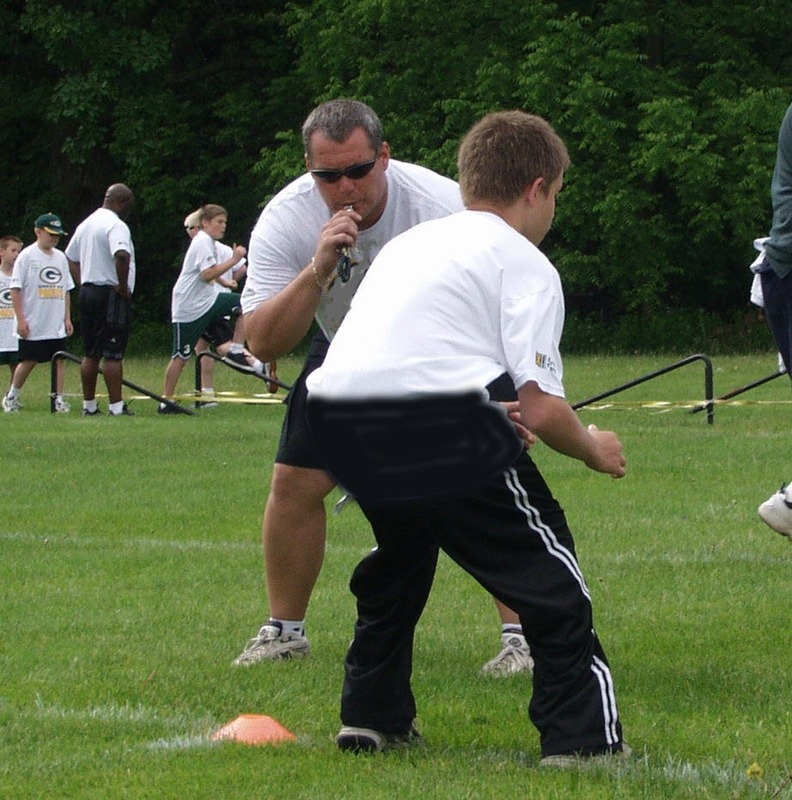 Campers learn to run, throw, catch, defend, form block, form tackle and explode out of their stance with proper technique and improved speed. We run active camps so kids get multiple chances. With patience and encouragement, kids gain confidence and that’s what it’s all about. Games, Energy and Excitement Drills are mixed with fun competitions, rewards, contests and personal challenges. Every camp day features game competition—either 5 vs. 5, 7 vs. 7 or small space games with a tournament platform. The entire camp is driven by team challenges and team building opportunities, culminating in Championship Friday and the final Awards and Recognition Ceremony. On a daily basis, campers are rewarded for demonstrating qualities that improve the overall camp environment. Those qualities include leadership, sportsmanship, hustle, effort, humility and positively influencing others. Blocking and Tackling Within a safe, non-contact format and applying the USA Football Heads Up curriculum, we effectively train campers to block and tackle so they play better, safer football. On a daily basis, players will develop the right posture, footwork and approach to playing the contact game effectively. We build muscle memory, skill and understanding, so campers compete with confidence and make big plays. WAIVER: A Release and Hold Harmless Agreement must be signed by a parent or guardian and submitted prior to the camp’s first day. The Release and Hold Harmless Agreement may be submitted electronically. Please see your confirmation email for your General Release and Waiver. All participants must submit a completed waiver in order to participate. IF YOUR CHILD REQUIRES MEDICINE: If your child requires medication, a Self Administration of Medication Form must be completed and submitted prior to the camp start. Camp staff does not administer or store medicine on behalf of campers. The camper must be prepared and able to self administer any medicine needed. Some camp staff are trained in first aid and will take action in the event of an emergency. REFUND POLICY: It’s a Strong Refund Policy. Here’s why. Pre-registration determines the number of staff hired and campers guaranteed to the facility. We financially commit to coaches, heroes and facilities for the week and do not turn back. That’s why we need you to be sure you are committed to us. Therefore, in cases of cancellation before or on April 15, 2019, $95 will be retained. After April 15, 2019, in cases of cancellation, we will retain the full registration fee. Customers using payment plan codes agree that your payment is strictly a deposit and does not represent a fulfilled payment. All Camp Policies apply, including the refund policy. Payment plans may not be combined with other discount offers. Amendments to policies through promotions, such as “Early Birds” or “past loyal customers” will be honored as stated through the promotion. CANCELLATION PROTECTION: Cancellation Protection is available for purchase during your camp registration procedure. You may purchase cancellation protection from your personal insurance agent or directly from Pro Sports Experience when you register, to offset some of the financial loss in the event you withdraw from camp on or after April 15, 2019. Cancellation Protection may only be purchased at the time of your original registration and may not be applied retroactively. Cancellation protection is non-refundable. With Cancellation Protection, in cases of cancellation on or before April 15, 2019, you will receive your money back less a $95 withdrawal fee. Or, in lieu of a refund, you may request a Camp Credit equal to the full amount you paid for this year’s camp (less the Cancellation Protection Fee) which may be applied toward next year’s camp. With Cancellation Protection, you may cancel your camp registration after April 15, 2019, and receive a Camp Credit equal to the full amount you paid for this year’s camp (less the Cancellation Protection payment) to be used at any camp during the following camp year. Cancellations must be made more than 72 hours prior to the start of the camp and will be awarded as a Camp Credit equal to the value of your camp registration fee (less the Cancellation Protection Fee). UNATTENDED DAYS: There is no refund for unattended camp days. Unattended camp days cannot be transferred to future camps. WEATHER RELATED ISSUES: In the event of severe weather at full-day camps, we will move camp activities indoors. We reserve the right to cancel the entire camp day (or any portion of it which remains). No refund will be issued for camp days (or portions thereof) cancelled for any reason. The decision to cancel and/or modify a camp rests solely with the management, facility manager and head coaches. In the event of severe weather at half-day camps, we will move into indoors or to a protective shelter. If the delay is prolonged we may choose to extend that day or any other day. We reserve the right to cancel the entire camp day (or any portion of it which remains). No refund will be issued for camp days (or portions thereof) cancelled for any reason. The decision to cancel and/or modify a camp rests solely with the management, facility manager and head coaches. At certain locations in the event of severe weather, we may bus campers to an alternate indoor location. Should that become necessary, we will send an email to your registered email address with full details of the plan. Please check your emails frequently during camp operations. YOUR CAMP LOCATION, DATE AND TIMES: Check your email confirmation and/or view the camp schedule here. FIRST DAY, MORNING CHECK IN TIMES: Check-in opens 45 minutes prior to the camp time. This is a one time process, occurring only on the first day of camp. A parent, guardian or authorized adult must walk the camper through the First Day, Morning check-in process. DROP OFF TUES-FRI: Camps may join us as early as 15 minutes prior to camp start, unless you have purchased extended supervision. See below for extended supervision details. PICK UP TIMES AND REQUIREMENTS: Pick-up occurs immediately upon the conclusion of the camp day–see the camp schedule for your specific times. A parent, guardian or authorized adult is required to pick up the camper at dismissal of each day. Due to additional commitments for our coaches, parents must be prompt for pick up. We can cover up to 15 minutes after the camp day ends, but it is prohibitive for coaches to remain any longer. If you cannot arrange for pick-up within 15 minutes of the camp day conclusion, please arrange for extended supervision. See below for extended supervision details. Check with your Camp Director regarding unique pick up and release logistics. EXCEPTIONS FOR PICK UP TIMES: If you have registered for “After Camp Offensive Skills,” “After Camp Position-Specific Instruction” or “Extended Supervision,” your pick up times will change. AFTER-CAMP INSTRUCTION: If you registered for a Half-Day Camp and added “After Camp” Offensive Skills or Position-Specific Instruction, your Tuesday, Wednesday and Thursday pick up time is extended by one hour. EXTENDED SUPERVISION: If you feel you must drop your child off more than 15 minutes prior to camp start or pick your child up later than 15 minutes after camp, please register for extended supervision. Call 877-226-9919 for arrangements. Please see your confirmation email for your General Release and Waiver. All participants must submit a completed waiver in order to participate. SELF MEDICATION WAIVER FORM: (IF APPLICABLE): If your child brings medication(s) to camp, please bring a completed Self Medication Permission Form. This form is mandatory and must be submitted upon your first day arrival at camp. If needed, please click here for the Self Medication Waiver. Lunch + Drink(s) for Full Day Camp; Snack + Drinks for Half Day Camps: Note about peanut products: A number of children with nut/peanut allergies are attending our camps. To further assist these campers, we are asking that you refrain from packing nut/ peanut products in your child’s lunch. We will have designated nut/peanut-free tables at which these campers may eat their lunch. Your official camp T-Shirt will be provided and must be worn every day. A great attitude–be excited for camp! We certainly can’t wait to play some football!